CoverArt Browser is a Rhythmbox plugin that lets you browse and play your music via an album art view similar to the one available in Banshee. The plugin ads a new "CoverArt" entry under the "Library" section on the left. 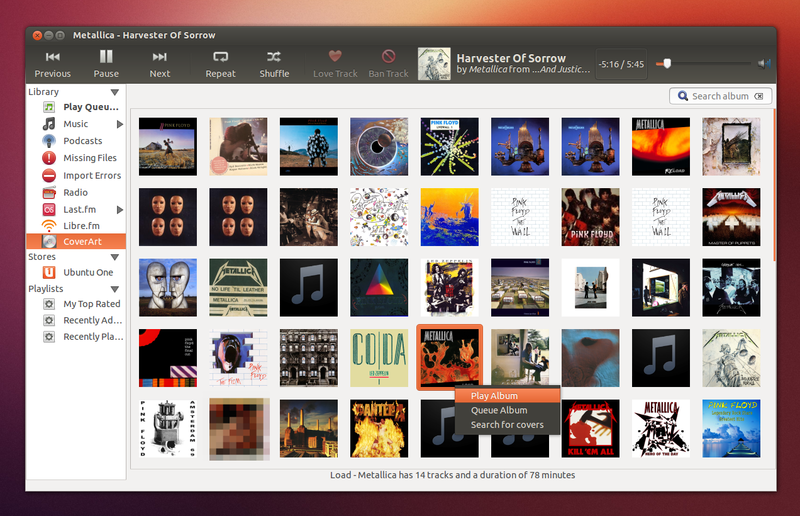 Once the albums are loaded, right click an album cover and you'll be able to play the album, queue it or search for covers. You can also easily search for albums by using the built-in album search feature. Right clicking the "CoverArt" entry on the left, you can select to download all missing album covers, a very useful feature, especially for large music collections without covers. CoverArt Browser was recently ported to GTK3 by Agustín Carrasco and AskUbuntu moderator fossfreedom, who's also behind a cool third-party Rhythmbox plugins PPA, so it should now work with recent Rhythmbox versions (tested with 2.96 and 2.97). This plugin isn't yet available in his PPA, but it should be uploaded to the PPA sometime soon. Update: initially, the plugin only worked on 64bit but it now works on 32bit too! Then start Rhythmbox and enable the plugin via Edit > Plugins > Cover Art Browser. Thanks to fossfreedom for the tip!